Please join the Last Chance Animal Rescue Society for Pup Night for Pups and help raise much needed funds. Tickets are $20.00 each and includes burger (vegie/beef/chicken), fries, a beer, wine or well drink. 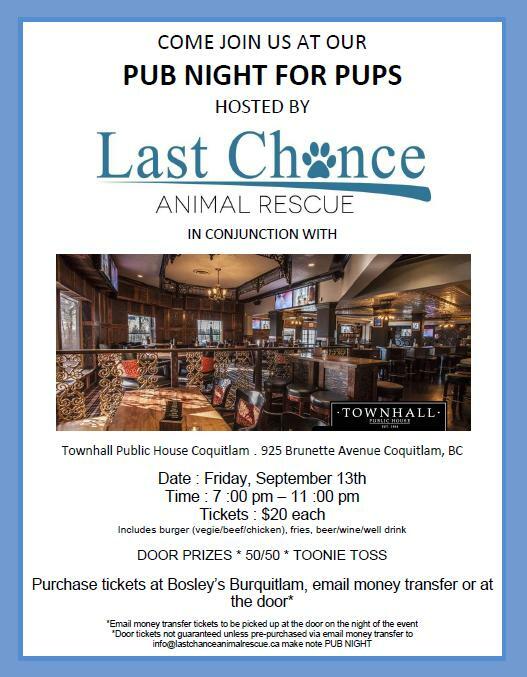 Tickets may be purchased at Bosley’s Burquitlam or by email money transfer. All tickets purchased by email money transfer may be picked up at the door. *Door tickets not guaranteed unless pre-purchased via email money transfer to info@lastchanceanimalrescue.ca. Please indicated PUB NIGHT in the transfer. Please email holly@lastchanceaimalrescue.ca for more information. This entry was posted in Fundraisers, Pet Rescue and tagged adoption, animal adoption, animal rescue, British Columbia, Fundraiser, Lower Mainland, rescue, Vancouver by Raquel. Bookmark the permalink.